This almost looks like a movie still with a bunch of extras. My favorite part (outside of the boat) are the dogs in the lower right corner. Feels like you could step right into this picture doesn't it? There isn't a date on it but I'd guess very early 1900's, not long after it was built. Thought I may have scanned this crooked but the people are standing straight so the boat must be listing towards the shore with too many passengers on that side. The original photo measures 6-1/4 X 8 inches, mounted on a larger piece of board. 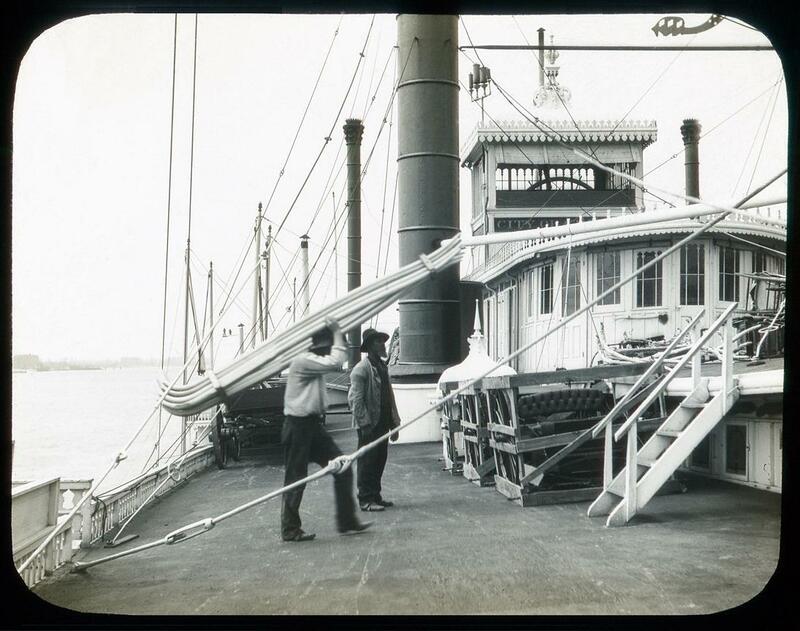 The little photo of top is from La Crosse, the bottom photo is a detail of passengers aboard the CHEVALIER on a glass negative. 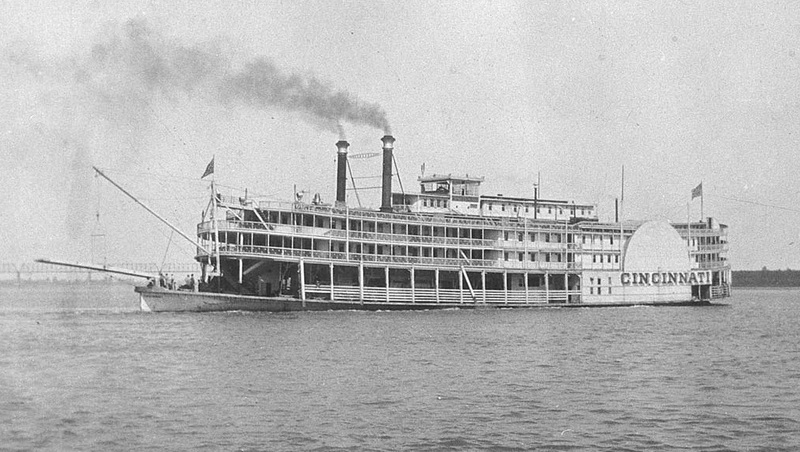 On May 22, 1907 at 1:00 a.m. she burned at the Cincinnati and Ohio wharfboat, Huntington, West Virginia. The fire department could not reach her due to the road being blocked by Chesapeake and Ohio Railway freight cars. Attached scan of latest "find." Glass positive transparency, image area 2.20 x 2.80 inches inside a 3.20 x 4 inch mount. 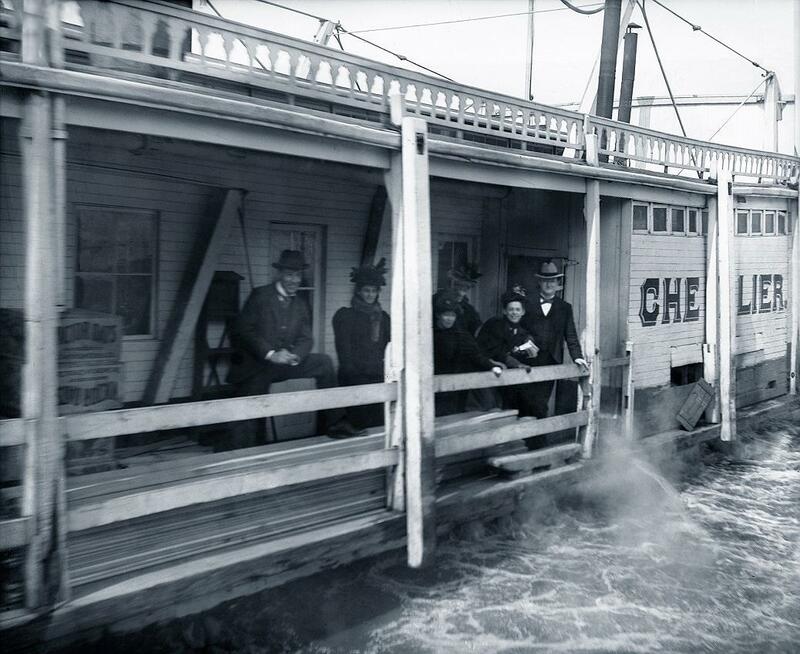 Have concluded that this 1889 photograph was taken aboard the CITY OF ST. LOUIS (1882 - 1903), taken on the hurricane deck with starboard smokestack, both 'scape pipes, the pilot house with 4 chime whistle, front of the texas cabin with windows and doors crowded on the front of it. Below them are the skylights of the main cabin and stairs leading to the roof of of the main cabin visible where the"rouster" in the foreground is headed as he carries a bunch of "double bend draft shafts" to which horses would be harnessed when they pull the of the buggies or carriages that have already been loaded on the decks. "Wow! Another gem of excellence in steamboat photography. The details are fascinating. The finial atop the clerk's office (behind the carriages) and the iron rods that held the stacks upright. And note the rolled up "blinds" that could be let down to cover the texas windows. I just enlarged the print and am amazed at the quality and detail. Wonder who the photographer was? Note the fire axe on the front of the texas with the axe head nestled in a heart shaped holder.The more I look the more I discover." Captain W. H. Thorgewan bought her at a U.S. Marshal sale at St. Louis, March 1898 for his bid of $19,050. 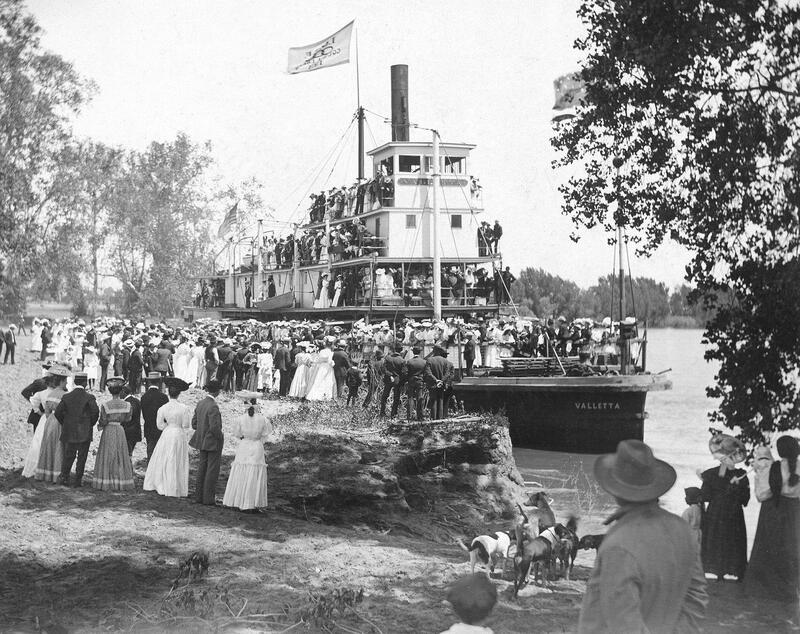 In 1901, she was running harbor excursions at New Orleans; President McKinley rode her that May. Sold early in 1903 to the Greater New York Home Oil Company but a U.S. Marshal stepped in and sold her to attorney T. Marshall Miller for $3,125. 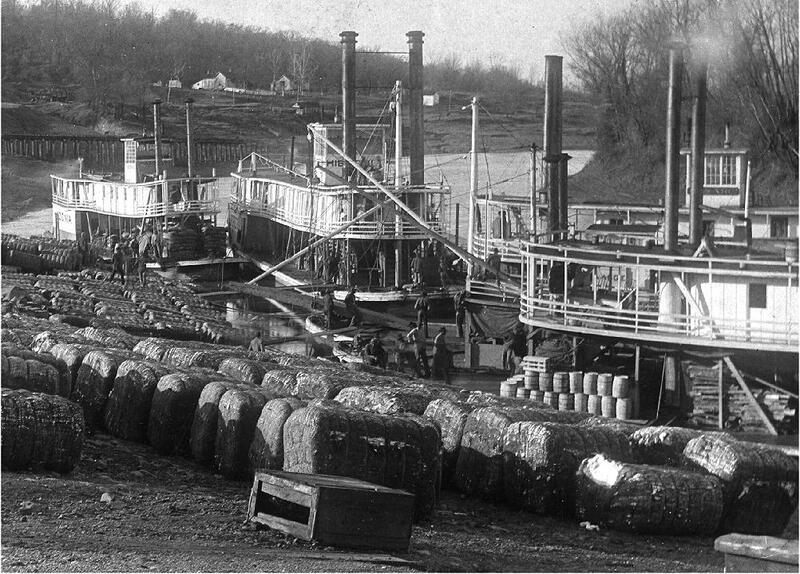 Laid up at Carondelet, Missouri and burned there on October 29, 1903. After she burned, the Anchor Line sold her original roof bell to Captain J. Frank Ellison and it went to the QUEEN CITY. 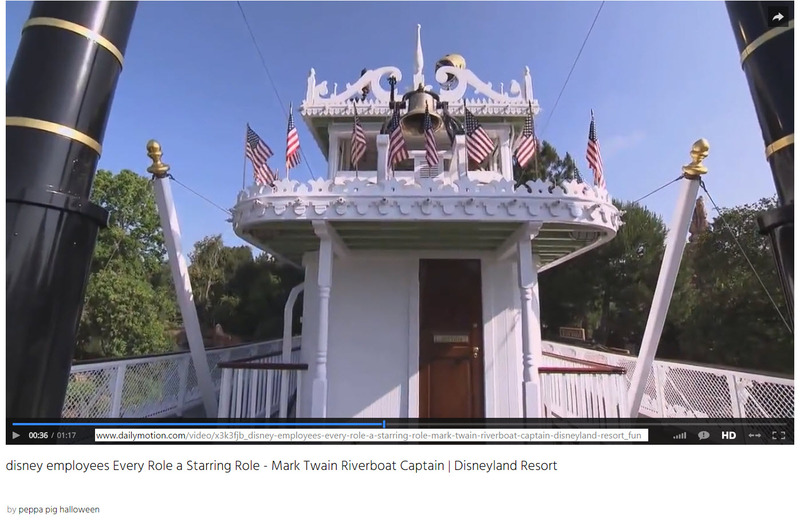 Disney employees Every Role a Starring Role - Mark Twain Riverboat Captain - Disneyland Resort video. Detail from "Night fall on the Ohio"
In the Library of Congress collection. Original price $40,000. Engines from Anchor Line's CITY OF HICKMAN. Port or owner's residence 1899, Cincinnati, Ohio. Teamed up with the CITY OF LOUISVILLE in the Louisville-Cincinnati trade. This was a well-proportioned sidewheeler. She came out carrying the whistle from the last TELEGRAPH but it sounded too much like the TELL CITY's whistle so it was exchanged and after 1907 she had the old BONANZA whistle which had last been on the double-cabin CINCINNATI. 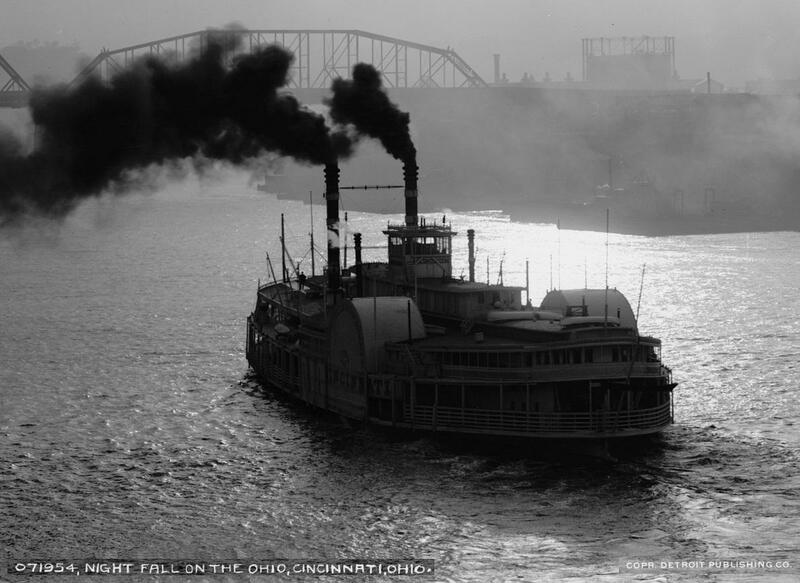 On January 20, 1910 while ascending the Ohio River, one of the CITY OF CINCINNATI's sidewheels hit the corner of a coal barge and the barge sank. Puddle Jumpers - There appear to be 5 boats in this photo although all you can see of one of them are its stacks visible between the 2 boats in the right foreground. Jim Hale identified more than the Yazonia and Hibernia, will have to ask him again what the other names were. This is pretty much the right half of a panoramic photo which included more of the riverbank to the left. The Yazoo was often not navigable when the river got really low and even these little puddle jumpers didn't have enough water to float on. Jim Hale identified the Yazoo boats for us. I'm attaching the same file again so you'l have the caption ready if you decide to hang the picture in the museum. The boat in front of the "Hibernia" is the "Des Arc." The boat nearest the bank is the "Fifteen" and the small pool style boat between the Fifteen and the Des Arc is the "Maggie." North Star of Rock Island on Upper Mississippi. This was one of the photos that was included in the Julia Belle Swain brochure when she was running out of LeClaire some years ago. Newest arrival, an undated Associated Press photo, possibly '40's of '50's Probably not a paddlewheeler but a nice looking boat with great name and signage. Nice that the life preserver included NEW ORLEANS on it. 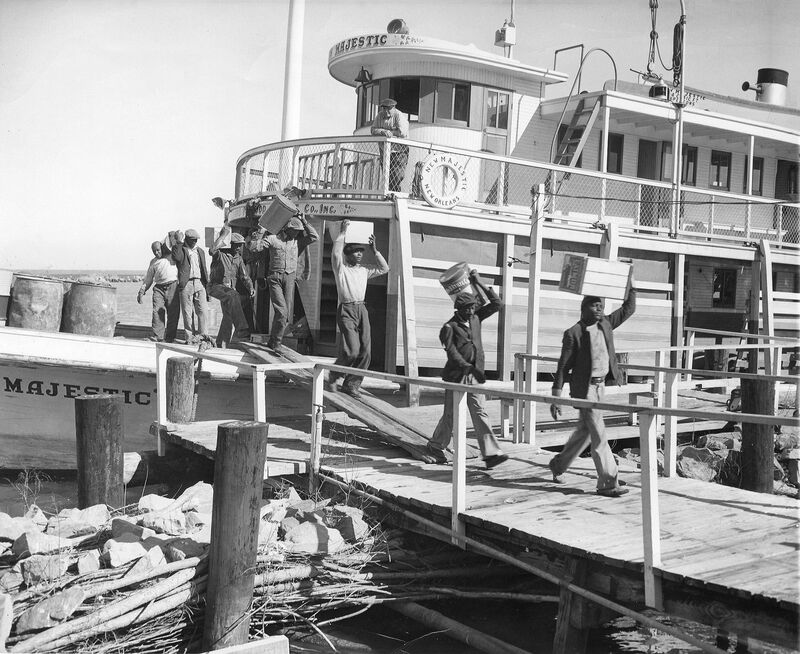 Packet boat which supplies delta with merchandise & returns to New Orleans with oranges, furs, fish, moss. Fascinating photo. Great detail. From the size of the stack and the shape of the pilothouse front I'd say a gas or diesel powered prop boat. Not steam, as she has a horn on the stack. Perhaps converted from an old steamboat with new upper works. Can't find any reference to her in Ways Packet Directory. Might be a good submission to the Reflector for possible i.d. The paint job looks fairly new or well scrubbed.